Maiko with “Nipponophone”, c. 1910. “Music, in Japan, calls to mind the geisha. Their lives are set to music – the years of their raining and the years afterwards are a succession of songs and dances. There is little music in the life of the ‘nice’ Japanese girl – she must be guarded from comparison with the geisha. The Nipponophone – Japanese Victrola – is opening a new world to her. “You ask what a Nipponophone was? It’s as much the word for phonograph in Japan as ‘Kodak‘ is for camera here in America. 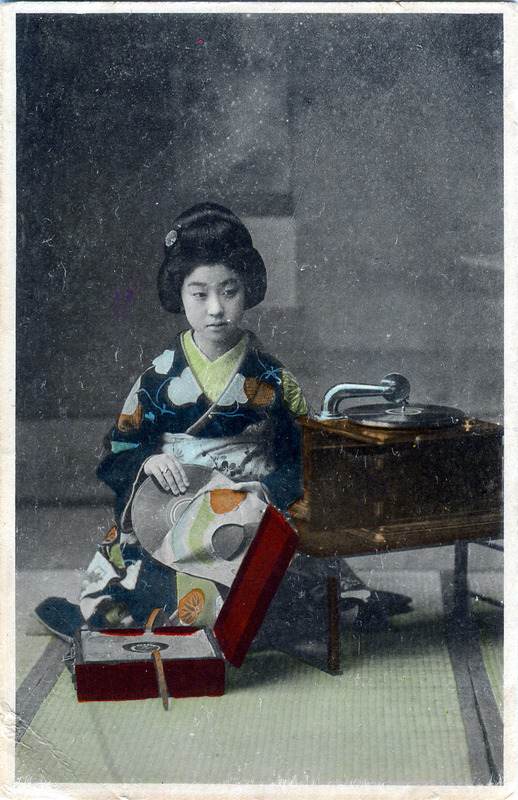 Nipponophone Company was organized in Japan in 1908. Immediately the idea was welcomed by the women who train geisha girls and hire them to tearooms and private parties. “The company is trying to introduce the Nipponophone into the public schools, but as yet the Dept of Education cannot afford it. Nearly 600 schools have privately bought the instrument. The phonograph is not used for teaching classical music, as it is in America, but for national songs and for marching.